Tech Savvy Seniors - Seniors Recreation Council of WA Inc.
Tech Savvy Seniors “Introduction to Technology” is a new initiative for Seniors Recreation Council of WA Inc, which aims to gently introduce Seniors to the benefits of modern technology. Computers and electronic devices are an integral part of our society and in some cases this lack of knowledge can lead to social isolation and a lack of mental stimulation. 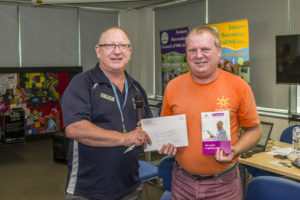 In an effort to help alleviate some of the barriers Seniors Recreation Council of WA Inc in partnership with Healthway, Department for Sport and Recreation, Department for Local Government and Communities and Telstra provide free Introduction to Technology Courses. Participants receive their own course workbook to keep for future reference. We come to the organising groups venue and provide our equipment, this way people don’t have to travel too far. Each topic runs for two hours with a twenty minute break (two one hour sessions) to allow for a drink. Up to six computers can be provided for small groups to practice on or individuals may bring along their own laptops. Ideally we prefer to have people who have little or no experience with computers. What is a Computer and its associated equipment? Basic introduction on how to use a computer. Internet Use – Email, Browsers, Security and Scams. Facebook introduction how we can connect with our families and friends. Skype Introduction – How to make free local and international video calls. Digital Camera – What to do with all those pictures, saving and sharing them. Contact Seniors Recreation Council of WA Inc on 9492 9773 and arrange a meeting and secure a date as time slots are limited. Arrange six to ten people who have little or no experience with computers or the internet, who can attend for four to six weeks. Provide a room or area which can be used for the training. We need a venue with six tables and enough chairs for the participants (not required if you have your own computer room). Arrange safe access to electricity and provide a beverage and biscuit for the break. Apart from providing Mobile Internet Services for the Tech Savvy Seniors Introduction to Tecnology Course Telstra will be hosting morning teas as part of thier Connected Seniors Training Sessions at various metropolitan locations. The aim is to introduce Seniors to mobile devices and learn more about tablets, mobiles and technology with Telstra retail staff. If you would like to attend a Telstra -Tech Savvy Seniors Morning Tea please contact our office on 08 9492 9773.